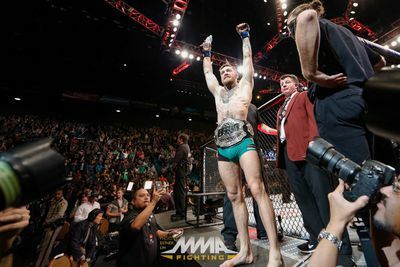 Just over a dozen ticks of the clock was all that was required for Conor McGregor to knock out Jose Aldo at UFC 194 last Saturday night (Dec. 12, 2015) to become undisputed UFC featherweight champion. Hey, he said he wasn’t here to take part, that he was here to take over (highlights), and take over he has. It may have been a sub-minute victory, but the newly-crowned featherweight champion made sure to note it was everything that led up to that point that made it happen. “To the naked eye it was 13 seconds, but to my team and my family it has been a lifetime of work to get to that 13 seconds,” McGregor said in a Facebook post. “Notorious” slept one of the baddest fighters on the planet at UFC 194. A legendary fighter who hadn’t been defeated in over a decade and made it look easy. Aldo came forward, faked a right hand and threw a left, but McGregor connected with a left hook just before eating Aldo’s punch and sent the Brazilian legend crashing to the canvas. And the Irish faithful at The MGM Grand Garden Arena through the roof. The brash and uber-confident Irishman has been prophetic throughout his time in UFC. He actually predicted he would knock Aldo out in the first round in under four minutes, and then went out and did so, setting a UFC title-fight record in the process, which surpassed Ronda Rousey’s mark of 14 seconds over Cat Zingano at UFC 184.